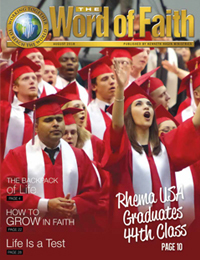 Travel back in time to 1968 and browse the articles and updates that got The Word of Faith magazine started. Enjoy reading a first-hand experience from a 1968 Prayer and Prophecy Seminar. Sit back and see what "God has Wrought" by Ward B. Chandler the first Word of Faith editor. Then finish up with a list of updates and information from the year, including the sell of services available, on both 5 inch and 7 inch reel-to-reels. Though the years, the magazine has changed and evolved but the message of faith and the strong presence of the Holy Spirit has stayed within it's pages. While we are ever looking to the future we take the time to honor our roots. Below are the updates and information that was published in the very first The Word of Faith, published in 1968. When we met Rev. and Mrs. Kenneth E. Hagin in Houston, Texas six years ago we had the witness of the Spirit in our heart relative to the unusual prophetic-teaching ministry of the Word resident in this choice servant of the Lord. Accordingly, at several intervals we have been privileged to enjoy his ministry as we have attended his revival meetings when he has been in our area. We also had a firm conviction that the ministry of this humble servant of God deserved a much broader circulation. Frankly, we longed for thousands instead of hundreds to enjoy the rich teaching of the word, as well as the end-time prophecy, and the gifts of healing that accompany his ministry at various times. But as we pondered the difficulties involved in promoting a ministry such as this: a ministry geared and presented in a humility that would never allow the usual, circus methods of publicity, we naturally wondered just how the great power inherent in this man could ever be harnessed and brought forth to the people by the thousands instead of the hundreds who were attending his meetings in those days. But God had a plan, and He knew how! It was our privilege to be in one of Brother Hagin's revival meetings in Houston, Texas when a brother minister prophesied that a radical change would take place in his ministry -- that God was sending him forth to minister to the vast host of people coming into the fullness of the Spirit from the historic churches. This was the seventh such teaching mission held at the Headquarters in the past two years and in spite of the winter storm, which dumped 10 inches of snow on us right in the middle of the meeting, it was one of the best. We had visiting friends from six or seven states, as far west as California, and as far north as Minnesota, Texas, Kansas, Arkansas, and several other states were also represented. 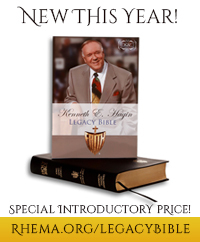 Best of all the Spirit of the Lord was present to honor His Word and to bless and anoint the ministry of His servant, Brother Kenneth E. Hagin, who spoke to us twice daily: at 10 a.m. and 7:30 p.m.
Rev. Buddy Harrison, office manager, presided in his own inimitable manner as platform M.C., leading the singing, presenting the entire program of tapes, books, etc., from day to day, and lending a hand at all times to make the meeting run smoothly and to keep every one comfortable. As usual, Brother Hagin's ministry was punctuated often with prophecy and wise council pertinent to the age and the dark day in which we live. Some were healed, some filled with the Holy Spirit (perhaps some saved) but we were all quickened, renewed, inspired, and built in faith! There was a freedom, spiritual warmth, and an intelligent presentation of the Word. If you were not privileged to attend the last Seminar here in Tulsa, you can still receive the inspiration and instruction in the Word that we who were present received, through the miracle of tapes and your recorder. The entire 10-day series is ready on either 7-inch reel, 3-3/4 speed, or 5 inch reel at 1-7/8 speed. 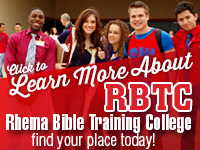 The entire series for only $28.00, or $3.00 for the day meetings, and $4.00 for the evening services (if you prefer to order a few services only). Send your order right away. A new tape on The Name of Jesus is now available, of which Brother Harrison says, it is his favorite of the tapes to date, and as you know there are many. he would like all to know that they now have a new process for making the tapes BETTER than before, so you will from now on always receive quality tapes when you order. The price of the tape THE NAME OF JESUS is $4.00. Brother Hagin has been invited to conduct a five-day crusade in Stockholm, Sweden and may be privileged to visit Russia, so he feels led of the Lord to go on the Airlift with the Businessmen, which will be leaving soon. If the Lord leads to help on their travel expense, please send your offering and mark it "airlift." Brother Hagin has felt the Lord urging him to get this faith message out in book form as fast as possible, and therefore we offer the newest book printed. JUST OFF THE PRESS! THE KEY TO SCRIPTURAL HEALING, the price is only .50 . In this new book Brother Hagin deals with wrong interpretation of the Scriptures relative to divine healing, showing us how our own ideas, and religious traditions have defeated us in our prayer for healing of the body through faith. With his usual simple logic he shows us how to press our claim, based on the Word of God, for complete deliverance. If you need healing this book is for you!